By Dwight Chittenden: IBF middleweight champion Daniel Geale (27-1, 15 KO’s) has really got a tough task on his hands on Saturday night against the longstanding WBA Super World middleweight champion Felix Sturm (37-2-2, 16 KO’s) when they face off in their unification bout at the Koenig Pilsener Arena, Oberhausen, Nordrhein-Westfalen, Germany. Geale, 31, has never really fought anyone with the kind of boxing skills that the 33-yer-old Sturm has going for him, and it’s going to tough for him to try and beat Sturm at his own game. Geale has battled his way to the top more because of of his boxing skills than his limited power. He doesn’t have the kind of strength that can give him an edge against if he’s unable to box his way to a decision. It’s going to be hard enough as it is trying to win a decision in Sturm’s home country of Germany, because the fans will be cheering everything that Sturm does in the fight. 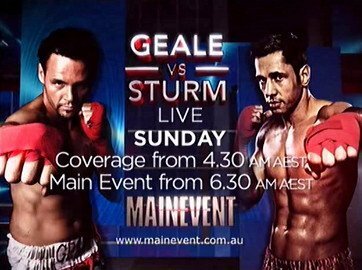 Getting a decision is going to be hard for Geale unless he can knock Sturm down two or three times to cement the victory. It’s not good that Geale struggled to beat Sebastian Sylvester in the past in 2011. Against the same fighter, Sturm easily beat Sylvester without any problems in a lopsided 12 round unanimous decision victory in November 2008. Sturm picked Sylvester apart with his jab and never let him get into the fight. Geale has looked much better as of late, defeating Eromosele Albert and Osumanu Adama in his two title defenses of his IBF belt. Geale neutralized Adama’s power quite effectively by using a lot of movement and in and out attacks to keep him from landing his big shots. Sturm doesn’t seem to be aging at all. He’s still fighting as well he ever did, although he’s struggled in two out of his last three fights. The problem seems more to be his competition has gotten better, and things aren’t easy like they used to be from 2007 and 2010, where Sturm’s opposition at middleweight was mediocre at best. The talent has gotten better and Sturm is having to work a lot harder.